The entire freaking floor was completely engulfed, and others too, above and below them. To scale, each window was a few feet taller than an average person. I think that's the 98th floor on fire. If that is, we had at least 1,000 computers on that floor, not to mention tons of cubicles, a library where paper files were stored, among other combustable materials. All of it would have combusted, and started a massive conflagration. Here's the floor plan for the 98th floor, you can see the cubicles (and their contents) that would have provided fuel. My desk was on the 99th floor, but the 98th floor was my area of responsibility (along with 99, and 100), so I knew pretty much everyone that worked on that floor, their faces, and where they sat. It would appear that most of the office contents that survived the initial impact were hurled across the floor from the force of the impact, and piled up on the southside of the tower. Those office contents, plane parts, among other things burned for the next hour and a half, and I think it's on the south face of the tower, where that stuff had been burning, where the collapse initiated. The worst part is pictures and video of the fire on the south face of the North Tower are rare and hard to find. Especially the 104th floor fire in the SW corner, which probably spread upwards from the impact floors through shafts in the core, and then burned its way across those floors. And for the record, the new Fiterman Hall is a turd compared the original 1959 Fiterman. So out of place. Last edited by Chapelo; March 3rd, 2013 at 06:49 AM. Does anyone have any pictures of the debris on the floor? All the paper and stuff? CLICK HERE TO SEE MY NEW YORK CITY PHOTO THREAD TO REQUEST PICTURES OR SEE AMAZING PICTURES! Do you mean on the street? Great video but this guy is crazy! I would have been long gone as soon as the South Tower began to collapse. 9/11 was beyond tragic, to lose so many lives and a great landmark in the same day. Windows on the World, kudos for actually having an open mind and not just buying what others tell you to believe. Its funny how as soon as you question the events of that day, in a realistic and unbiased way, you must be some sort of deranged nut. Just as quick as that. The North Tower was hit on the 92-98 floors (being generous, other reports 94-98). The tower was 110 stories tall. Therefore, 18 stories of building collapsed the entire rest of the building (92 floors). All the way down to the bottom. The problem is, those 92 floors were undamaged, meaning they were fully ready for the weight of 18 stories. So on 9/11, the weight of 18 stories totally destroyed the lower 92 floors in about 15-20 seconds. It was not a concrete block. It was a massive bundle of interconnected beams that aren't capable of holding so much extra energy. Conspiracy theorists are known to edit out certain parts of quotes to fit their agenda, as well as lying (molten steel theory) so yes, they are making things up. They also take many other events out of context and make easily explained events turn into 'mysteries.' Don't believe everything the 911 truth movement wants you to believe, I learned that the hard way. You can quyestion, but be sure to listen to the answers given to you. Truthers don't usually do that. 'Rate of change of momentum is proportional to the impressed force'. That is not a particularly complicated idea. If you push a car along a level road, it will move very slowly at first but speed up as you push it until you would have to run to catch up with it. If someone else then tried to stop the car, by standing in front of it and holding their arms out, they might well find that they would be run over by the car as they would need superhuman strength to stop it in an arms length (depending on the size and weight of the car). That is because, your pushing the car increases its momentum and, if you push it over a length of several metres, it will get so much momentum that your friend, trying to stop it, would have to run backwards while pushing the car for a similar distance. That is basically what happened with the World Trade Center tower. The supporting structure failed at the point of the plane impact and the tower would have fallen by a distance of ten feet (one storey height) - not a great distance but it would build up so much momentum by the time it hit the floor beneath that the force required to stop it would be many times the weight those storeys imposed when intact. It is just the same as the car analogy, momentum built up over a distance of ten feet would have to be resisted in a distance of some few inches. Ironically, it would be the rigidity of the steel structure of the tower that would be against it. A steel structure (even one hundreds of feet tall) can only give a few inches due to the natural 'give' in the steel. The uppermost storey beneath the impact zone would collapse and the mass of that storey would then add to that of the eighteen storeys above and so increase the load on the storey beneath - and so on until the tower collapsed completely. That is known as a progressive collapse. It is probably true that the WTC was very vulnerable to progressive collapse. Although the external closely spaced columns and the core columns would have been very strong, the floors, which held the structure together were of relatively flimsy construction (six inches of concrete supported on lightweight steel trusses). The loss of the floors removed the restraint to the main columns meaning that they became destabilised. I appreciate your responses. Too often this conversation turns into someone getting angry for some reason, I never understood that. While I am not an engineer, I feel as if we aren't giving the WTC structure enough credit. This is not a fragile structure, ready to collapse the moment an extra force is added to it. This was a beast of a building, with 59 steel beams on each side, and large steel beams in the core. It is a disservice to the architect to assume the whole building would collapse because of some damage to the top of the structure. I just have to add, about the car analogy. That car would pick up speed, yes. However, in the case of the WTC, as soon as the falling floors hit the undamaged floors, it would encounter resistance. Now, this resistance might not stop it at once..but we seem to be assuming this resistance adds up to..nothing? Take a moment to think about the resistance these floors would have encountered. This 18 story section is encountering a massive, undamaged beast. Also, lets see if we can demolish a building in such a way. Go down 16% from top of building. Cut all exterior steel and core columns at this spot. We should see the top 16% fall one story downward, and then continue to demolish the rest of the structure. Lets ask some demolition experts about this. To be fair, Rizzato has a point. By undamaged beast i'm guessing you mean the acre in size floor and all of it's trusses which would in fact be a load bearing beast because they all worked together to cary the load. However, the moment the building started collapsing (before it's total collapse) the floors were collapsing unevenly, and some trusses were exposed to heavier loads than other trusses. Even the tower's total collapse occurred unevenly. It would make sense that the tower could collapse in such a way. What i still don't understand to this day is the total disappearance of the core. Last edited by windowsoftheworld; March 20th, 2013 at 03:10 AM. Remember, the core on the originals were much smaller and weaker than the new 1WTC's. It wasn't designed to withold a plane's impact (a little cliche, but true). Find More Posts by L.A.F.2. Meh it wasn't small nor weak, in fact, it was the only rigid structural "thing" about the twins, the rest was pretty much open space. I too hate it when these conversations descend into angry ranting. That's why I am assuming that you are open to the idea that the WTC collapsed for no other reason than that it was hit by two hijacked planes and aren't wedded to the idea of a conspiracy. I don't think that I am doing the 'architect' (actually the structural engineer, Leslie Robertson) any disservice by assuming that the tower collapsed due to the reasons I have described. Your use of the terms 'fragile' and 'extra force' shows that you have completely underestimated what we are talking about here. Let me try another analogy. I am writing this on a laptop on a glass-topped table. The table isn't fragile and has no problem supporting the weight of not just one laptop but probably twenty or more. However, should I have a fit of pique and decide to drop my laptop from a height of ten feet onto the table, I wouldn't be surprised if the glass were to break. That is because of g - the acceleration due to gravity which is 9.81m/sec/sec (or in imperial units 32 ft/sec/sec). That is a constant on the Earth's surface and is irrespective of the mass of the object falling. Now, I understand that each tower of the WTC weighed about half a million tonnes, which means that 16% would be 80,000 tonnes. Imagine the impact loading that would cause on the structure underneath. (You can work this out using the equations of motion but it is safe to assume that it would be many times that which the structure was designed to take). There are other factors at work here. This was not a simple case of one whole storey suddenly disappearing and the tower above dropping ten feet onto the columns of the storey below. In practice, the collapse would have been very uneven. One weakened column would fail leading to overloading of its neighbours that would also fail and so on. So the mass of the tower above would descend very unevenly onto the storey beneath, with a large part impacting onto the lightweight floor structure rather than the perimeter columns (just see the floor plan posted by Chapelo and you can see the small proportion of the total area occupied by the main vertical columns). I fully agree with you that the collapsing tower would encounter resistance from the structure beneath but that resistance would be less than the force from the collapsing structure. That is not the same thing as saying that the resistance amounted to 'nothing'. Going back to the car analogy, if your friend tried to stop the car that you had been pushing for a while, he would succeed in slowing it down but it would push him off his feet. (However, where this analogy falls down is that the speed of the WTC collapse would be constantly increasing due to the effect of gravity - as if you kept on pushing the car even after your friend had been run over by it). I am not a demolition expert but I don't see that there is anything that difficult in understanding how the collapse of the upper section would lead to the total collapse of the tower. The very large momentum of the upper storeys collapsing would easily collapse the first undamaged storey that they encountered, then the weight of that storey would be added to the mass of the collapsing structure, so that when the next storey down was encountered, the mass would be greater and the speed of collapse would be greater due to the acceleration due to gravity. So, the storey below would collapse even more quickly and so on until the whole tower was demolished. The speed of collapse would be very close to freefall. (I suggest that you Google the Ronan Point disaster. This was a 20 plus storey tower block in London of which a whole corner fell down back in 1968 due to progressive collapse. The cause of this collapse was an old lady lighting the gas in her flat where there had been a gas leak. The resulting explosion was so weak that the lady survived but it resulted in a massive structural failure). The floors were the weak points in the building. If you go back to earlier designs of skyscraper such as the ESB, the floors would have been heavy steel supported at regular intervals by a grid of columns over the whole plan area of the building. By the 70s, firms favoured open plan offices with large unobstructed areas of floor space so the floors had to span a long distance from the outer columns to the central core. To save on weight, the floors were constructed from lightweight trusses topped with about 150mm (6") of concrete. These floors would be perfectly adequate to take the loading from people and furniture but not the impact loading from the collapse. The failure of the floor trusses is probably the key to understanding the collapse of the whole building including the core. What each floor did was to ensure that the building kept its shape - much the same way that the diaphragms in an aircraft wing make it rigid. With the floors collapsing, the external and central columns would no longer be propped and would no longer be capable of supporting the weight of the storeys above. Although the central core had a large number of very strong steel column sections what it probably lacked was sufficient diagonal bracing to enable it to stand up when the propping effects of the floors were removed. (Even with a well-braced core the shear slenderness of the structure would make it very unstable over the height of the WTC and it would probably have collapsed within seconds of the external structure collapsing). 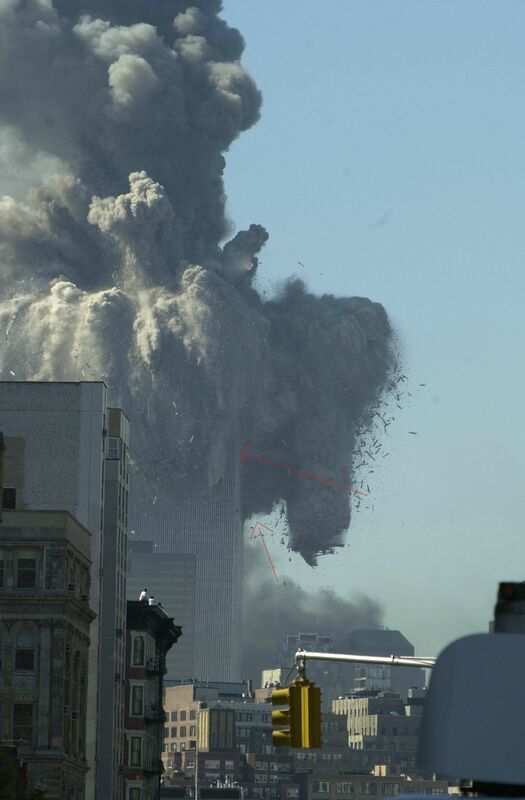 (If you see videos of Tower 1 collapsing, you can see some of the core columns projecting above the top of the smoke and dust cloud - but these would not have sufficient stability to remain in place).